No matter what your Amphenol Cable needs may be, you can find lots of brand name Amphenol Cables at www.TWAcomm.com at the prices you’re looking for. When you’re in the market for Amphenol Cable, the easiest way to find just what you need for your business (or home) is to go to www.TWAcomm.com and check out the supply of Amphenol Cable available. 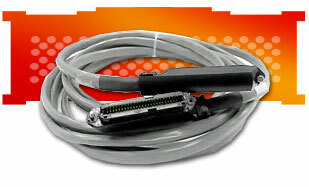 How about Siemon 25 pair /50 pin Amphenol Cable. This 50 pin Amphenol Cable connects phone systems to punch down blocks. This fine product comes in single and double as well as various lengths. At www.TWAcomm.com you can also find Allen Tel 25 Pair/50Pin Amphenol Cable with a 90 degree plug, male/loose, 25 pair of connector cable with a male plug on only one side. The special features of this product are: Fully color coded bank marked with individually twisted pairs for easy identification, the conductors are 24 AWG solid, bare annealed copper wires, Polyvinyl Chloride insulation, Polyvinyl Chloride gray jacket ripcord installed between the core and jackets for easy jacket removal. Perhaps you’re in the market for an Allen Tel 25 Pair/ 50 Pin Amphenol Cable with a 180 degree plug, male/loose. 25 pair of connector cable to panel plug, on one side. It's features include polyvinyl used as insulation over the conductors, which are 24 AWG solid, bare annealed copper wires, polyvinyl chloride grey jacket ripcord inserted between the core and the jacket for convenient and easy jacket removal. At www.TWAcomm.com you can also find the Leviton 24/48 Port Patch Panel – Voice Grade with Amphenol Cable. It is pre-configured with 24 or 48 ports, voice grade patch panel designed for voice applications. The standard equipment rack mounts on a 19 inch TIA and has both bottom and side cable entry. It comes with 25 pair female connectivity on the back panel. The special features of the Leviton 24/48 Port Patch Panel – Voice Grade with Amphenol Cable include: 8 position/ 2 conductor jacks, voice grade patch panel, and 25 pair of female Amphenol Cables on the back (24 ports and 2 connectors). No matter what your Amphenol Cable needs may be, you can find lots of brand name Amphenol Cables at www.TWAcomm.com at the prices you’re looking for. It’s so much easier to shop for your Amphenol Cable at www.TWAcomm.com online and save yourself all of those annoying trips to the store in search of the products you need by the manufacturers you trust. The solution to your Amphenol Cable problems are as close as your computer, when you’re ready to shop! It only takes a few minutes to select just the right product and order it. You won’t lose any time and can place your order any hour of the day or night. Why not go to www.TWAcomm.com right now? !